It’s that time of the week again, Fresh Friday. I headed over to Soergel’s without a plan to see what looked good and lucky for me, I spotted something that vaguely reminded me of green rolling hills and shamrocks. Watercress. With St. Paddy’s Day on Monday, and the parade going downtown as I shopped (okay, I was a day behind, it happens), I picked up a bunch. Yes, I know it isn’t an Irish vegetable per se, but at least it sparked the thought. That said, it is used in cuisine around the globe. French, Chinese, Vietnamese, Mexican…you name it and it probably has a place. Apparently, this fast growing, aquatic plant is considered the oldest known green vegetable to be eaten by people, dating back to the ancient Persians, Greeks and Romans. Who knew? In the U.S. it is most commonly seen in salads or occasionally as a sandwich topper, but in places like England, it is utilized in just about anything including traditional high tea sandwiches. Yes, I could have done a salad or suggested making tea sandwiches to introduce your child to this peppery veggie wonder, but I decided I wanted soup. With a nip lingering in the air and references to it in egg drop soup and such, I took that route. I’ll be the first to admit that my timing on the soup is a bit off and the ingredients are prime in summer, but I gave it a go. Spring has been taunting me. 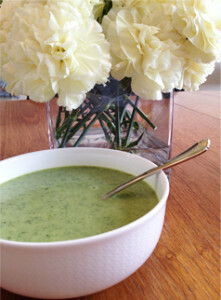 So give this gluten free Summer Zucchini and Watercress Soup recipe a whirl. On medium heat, heat olive oil. Add zucchini and onion to cook down for five minutes with the lid on. Add water, bouillon cubes and watercress. Lid again and let cook until all are fork tender. Blend contents in blender and pour back into the pot. Add heavy whipping cream, and salt and pepper, if desired. During the summer, I would leave out the whipping cream to keep it lighter and incredibly healthy. It was quite tasty at that stage too. This will definitely been seen in my kitchen again. I liked the flavor of the green itself and could easily be added to countless foods for a nutrition boost. 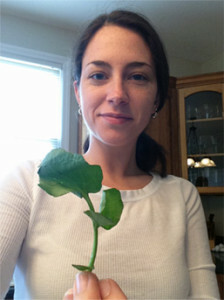 To learn more about watercress, which after some reading I’m surprisingly impressed by, check out Watercress.com. It is full of unusual facts and information like when Hippocrates founded a hospital in 400 BC, he planted watercress in nearby natural springs for use in blood disorders! And that it is chock full of folic acid making it a super food for pregnancy. There are many reasons to say yes to watercress, at least once. I’m happy I did.